You have to be very careful when dealing with random webmasters you find on the internet. Webmasters are like used car salesmen, they say whatever they want to say to get the job. In an industry where there is no oversight or certifications required, you have no idea of the qualifications of your prospective webmaster. Here are some rules you should consider to protect yourself. Rule 1: Make sure they speak English (or your native language) as a first language. Communication is the hardest part. If you are not sure if your webmaster understands what you want, what are the chances of it working out. Rule 2: Feel Them out a bit. Speak to them on the phone, feel them out. See if you click with them. Ask them some questions and see how they answer them. If you do not like the answers, move on. Rule 3: Location. If you are in North America, your webmaster should also be in North America. It sometimes seems that cut rates are attractive from webmasters across the globe but it rarely works out. The language, time zone and cultural differences are too great to overcome. Rule 4: References. Check out their references, testimonials and third party reviews. Be careful on the fake reviews that are easy to spot. Example: "They are great", John, New York. This review is way too short. There is no full name, No phone number or email address. There is no date or website address of the customer. This review has zero value. Third party reviews from Google reviews and other third party review sites have much more weight. Rule 5: Monthly fee scam. Do not get trapped into the monthly fee scam. It seems like the webmaster is doing you a favor by giving you a flat fee every month. This seems like a good idea so you can budget your cash flow. How it really works is as follows, you pay a flat fee every month whether your webmaster does any work or not. Usually it is something like $120.00 per month. For that you will receive two hours of work. If you go over, you pay more. If you don't use it, you still pay. It is way better for the customer to go 100% pay per use. Rule 6: Experience. Like every other industry, experience is king. It's not a good idea to trust your business venture to a brand new recent graduate as that person will have no experience or track record. Maybe they will be great but most likely they won't have the tools necessary to do a professional job. Always remember that your website is a reflection of your business. If it isn't very good, you can chase your potential customers away before you ever have the chance to speak to them. Contact us at the computer geek, we will take care of your website so you can sleep better at night. 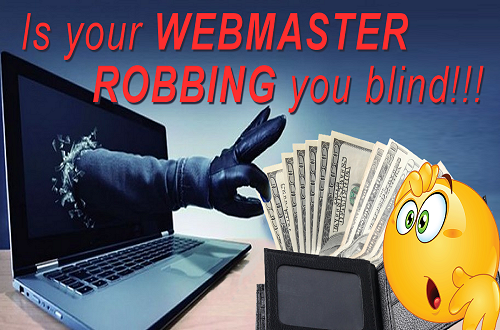 Is your webmaster robbing you blind? | Computer Geek 5 out of 5 based on 103 user ratings. Is your webmaster robbing you blind? - You have to be very careful when dealing with random webmasters you find on the internet. Webmasters are like used c . . .